The largest research event in the German-speaking world takes place every two years. During the eighth Long Night of Research, Anton Paar Graz reopened the doors to knowledge-hungry visitors from 5 pm to 11 pm. The event attracted a total of 228,000 visitors at 265 different locations all over Austria. Realized by highly motivated employees, Anton Paar had an above-average attendance of 1640 guests in 2018. Research and science determine our everyday life more than we are often aware of. Anton Paar supports everyday life with precision measuring instruments and innovative technologies - whether in the beverage, chemical, mineral oil, pharmaceutical and cosmetics industries, or in material and surface characterization, to name but a few. The aim of the event is to promote the exciting world of research in a more playful way. By looking behind the scenes, Anton Paar made research first-hand experience possible. The successfully realized aim was to convey as many impressions of the Anton Paar world as possible, to enable personal conversations with researchers and to present oneself as an attractive employer. A total of nine stations were represented, including production, assembly and logistics as the largest station. Thanks to the "open-house principle", visitors were able to move freely around the grounds and choose the topics of most interest to them. Chocolate, toothpaste and sweet drinks attracted visitors to the demo lab. All about density and viscosity could be learned through demonstrations, a chocolate fountain and toothpaste experiments. The largest station was the production, assembly and logistics. A tour through mechanical and electronic manufacturing, logistics and device assembly gave an idea of how to turn a metal block into a precision instrument. Visitors were fascinated by the complex technical processes, robot-supported workflows and the view of the metal laser sintering technology. In the electrical production, the assembly of printed circuit boards with components and chips could be observed. In logistics, insights into everyday working life and information about the position of "warehouse logistics technician" were waiting for the visitors. In the assembly of the world's most accurate density meter, Anton Paar's specialists demonstrated how the parts produced in-house become measuring instruments that are used internationally by well-known companies. Insights into the company's research activities at a nanoworld level guaranteed a varied and informative program. The Anton Paar in motion team provided movement, fun and play. A children's workshop with experiments on magnetism and mobility was offered in the kindergarten. The human resources department was also well represented, with a "spirit of innovation" in search of new employees. Our brewery was of course a great place to visit - to learn how good beer is made and measured, and to enjoy it. 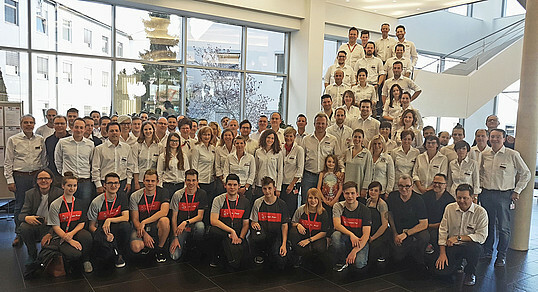 More than 100 motivated employees realized the Long Night of Research at Anton Paar in Graz.